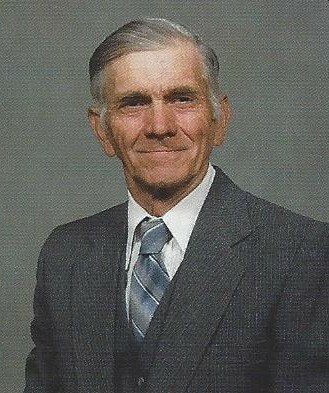 Nelson Henry Mertens, age 94 of Linn, passed away on Sunday, June 17, 2018, at General Baptist Nursing Home in Linn. Nelson was born August 6, 1923, in Linn, a son to the late Lawrence and Lena (Niekamp) Mertens. Nelson attended a rural elementary school near Linn. Nelson served in the United States Army during World War II. Nelson was a lifelong dairy farmer raising cattle, and hogs. he also enjoyed working in his vegetable garden and tending to his fruit trees. When he wasn’t busy working on his farm he loved attending auctions where he could not only find a good deal but also make new friends. He was a member of St. George Catholic Church in Linn. Nelson is survived by: four nephews, Larry Kliethermes and his wife Martha of Westphalia, Irvin Kliethermes and his wife Sandy of the state of Indiana, Wayne Kliethermes and his wife Donna of Loose Creek, and James Kliethermes and his wife Ellen of Loose Creek. In addition to his parents, he was preceded in death by; two sisters, Bernadine Kliethermes, and Marie Mertens; two brothers, Ralph and Andrew Mertens; one niece, Patricia Lambert. Visitation will be held from 4:00 p.m. to 7:00 p.m. on Tuesday, June 19, 2018, at Morton Chapel in Linn. Mass of Christian Burial will be held at 11:00 a.m. on Wednesday, June 20, 2018, at St. George Catholic Church with Fr. Daniel Merz as the celebrant. Interment with Full military honors will follow at St. George Parish Cemetery. Expressions of sympathy may be made to Masses or St. George Catholic Campaign Fund.